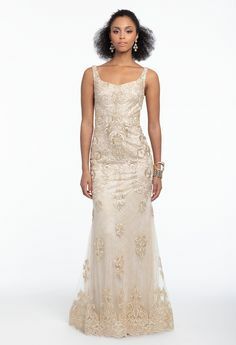 With its full skirt and figure-hugging bodice, a ball gown style works for all body types, especially if you’re tall, as the grand shape balances out a long frame. But petites, have no fear! Ballgowns are flattering for you too; just look for an A-line style with a skirt that’s not as full. The Camille La Vie collection offers a range of beautiful ballgown prom dresses that give off that “I just stepped out of a fairytale” vibe. Ready for a happily ever after evening (and plenty of twirl-worthy Boomerangs?) Explore stunning styles in both shiny satin and ballerina-esque tulle, with a variety of gorgeous necklines like strapless, spaghetti strap, illusion, and more flattering cuts. 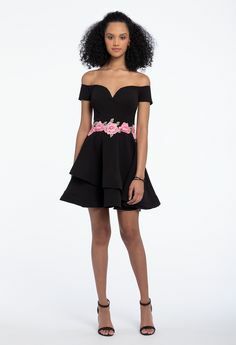 And we know you’ll fall in love with the pretty embellishments; find luxe beading, chic applique, and rich embroidery, among other standout details. Whether you’re a limelight-loving princess or prefer to look chic on the sidelines, browse a variety of ballgown prom dresses that are made for an unforgettable evening. Shop these styles and more on CLV.com!